Yes, since last October 1st, you can entry the Lamp Awards 2019 here! Proud due to the consolidation of the Lamp Awards in the lighting industry worldwide -with 608 projects submitted from 54 countries in the record edition- we return to the fray with a new edition, the 8th, eager to reward good lighting and with a jury who worths it. The OUTDOOR LIGHTING Lamp Award rewarded with €3,000: lighting projects (non ephemeral) for outdoor illumination works built such as: facades, monuments, sport facilities, public squares, roundabouts, streets, parks, bridges, tunnels, etc. The INDOOR LIGHTING Lamp Award rewarded with €3,000: lighting projects (non ephemeral) for indoor illumination works built such as: shops, restaurants, hotels, museums, offices, exhibition halls, etc. The INSTALLATION LIGHTING Lamp Award rewarded with €3,000: lighting projects (ephemeral), both for outdoor and/or indoor spaces, kind of more artistic, playful, social, etc. 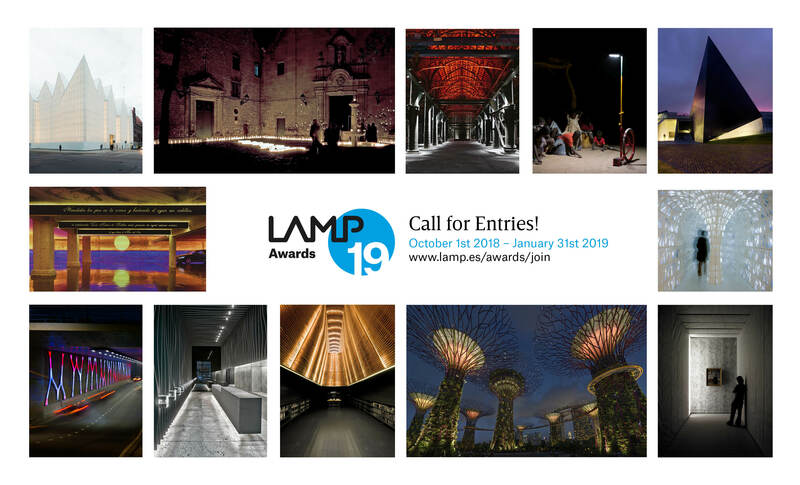 The STUDENTS PROPOSALS Lamp Award rewarded with €1,000: this year theme is “Luminous ambiances within a large scale”, lighting projects, both outdoor and/or indoor, in which light can create atmospheres. How light and lighting can help to create luminous ambiances in large scale spaces or territories, dealing with both the city geography and the human scale: large urban areas, nightscapes, transport interchanges, leisure parks, city centers, social housing, etc. Only idea-based/conceptual projects will be accepted (that is, projects not built). Light is a fundamental element of life and a key aspect of any architectural project. Prizes will be awarded to projects that have successfully met the architectural lighting needs of an indoor or outdoor space, having created a positive synergy between architecture, interior design, urban planning, landscaping and lighting. The Lamp Awards value the creativity, innovation and sustainability of lighting projects, regardless of the manufacturer or the brand of lights used in the project. If you are a lighting designer, architect, urban planner, interior designer, engineer, landscaper or student, we encourage you to present your/s lighting projects! Remember: Inscription and submittal from October 1st 2018 to January 31st 2019 here (download the contest rules here).